England’s seaside towns are unlike anywhere else in the world. They were the places that the country’s industrial workforce went for rest and relaxation, certainly, but the mass market that appeared there meant that they were also the places that industry carried out its research and development. Seaside towns are scattered with rusted remains of prototyped cutting-edge technology, from concrete seawalls and cliff paths secured by man-made stone to mechanical marine lifts and electric railways. So Folkestone, overlooked on the South Coast because Dover, Hastings and Brighton have more pizazz, is an interesting place for an international arts festival, especially as it became a prime stopping-off point, as people abandoned the south coast’s seaside and headed for the continent. There are two strands to Folkestone’s festival – the ‘official’ bit is the Folkestone Triennial, titled ‘Lookout’. Running alongside it is the Folkestone Fringe, on the theme of ‘Future Now’. Both run from 30th August-2nd November, and together, they’re a very good reason for (at the very least) a daytrip to Folkestone. In all honesty, you’d need a weekend to fit it all in, especially as events, installations and interventions are spread out across the town, with some walking needed to get from one to another. Our one-day visit with children was certainly not long enough to get more than a glimpse of an interesting event. 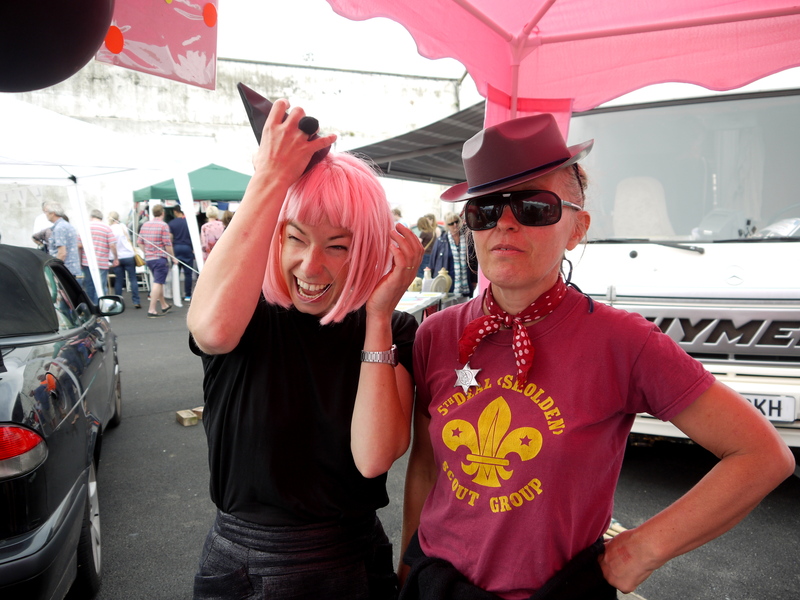 We started at the Art Car Boot Fair. This I was excited about; I’ve seen reviews of this in London, but never been able to make it (not living in London, I can’t always get there). The idea is simple; well-known artists and emerging artists side-by-side, selling affordable work from the boot of a car. The reality, though, was a little different. Emerging artists and small galleries made all the effort, with new work and a degree of performance in their presentations. Tom Swift and Paul Hazelton‘s De-In-Stall, Heidi Plant and Julia Riddiough (pictured), Bayle Window Lost Pigeon Archive, Quiet British Accent, Hello Print and Sadie Hennessey stood out. Collectively, these artists created a chaotic carnival atmosphere. The name artists, meanwhile, knocked out work to a willing audience of ebay dealers who were throwing cash at them. At the Emin International stall, a proper fight broke out between two pushy dealers. Meanwhile, Peter Blake didn’t make an appearance, but you could buy a colour photocopy of an old Folkestone postcard with his signature on it for £60 from a trestle table. Now – I’m a huge Peter Blake fan and own half-a-dozen of his works, but even I can see that’s just lazy. 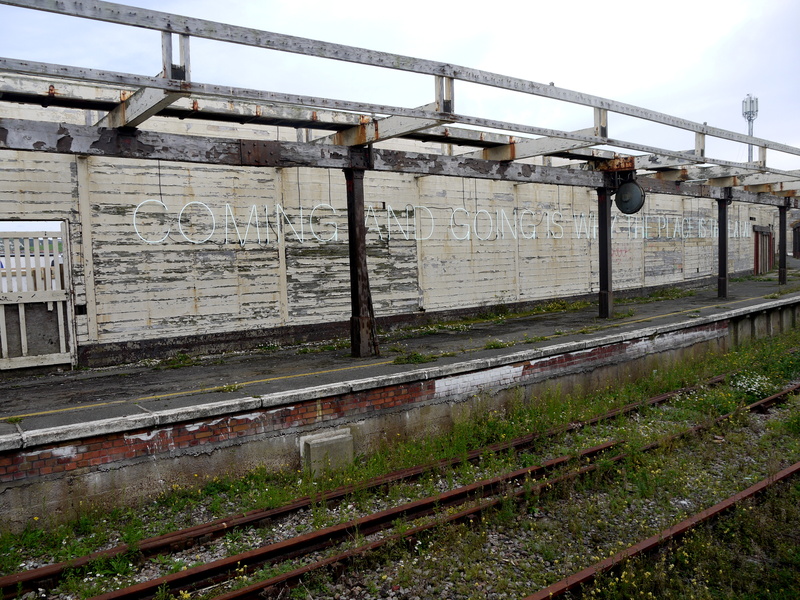 Just round the corner from the Art Car Boot, on the platforms of the abandoned Folkestone Harbour station, Tim Etchells has installed ‘Is Why The Place’, a pair of neon signs, one on the ‘up’ and one on the ‘down’ platform. This work is simple but effective, occupying the space well. We saw it twice; on the first visit, families were wandering along the abandoned rail tracks and climbing across both platforms, unguided urban explorers. On the second, a steward had stopped people leaving the platform they entered on; the work was far more powerful when you could explore the station, rather than being a passive viewer, standing on one side and looking across to the other. And I think people can manage that slight risk for themselves. Adjacent to the station, in an old waiting room or ticket office, is a small exhibition, presumably part of the fringe but unsignposted and unlabelled. It’s well worth finding – the work is about travel and journeys and the atmosphere of the unloved space (pictured below) is a perfect complement to the art. We wandered along the seafront after the station, visiting the Folkestone Future Choir‘s ‘Lookout!’ before stopping at a battered white shipping container under AK Dolven’s piece ‘Out of Tune’. This bell, suspended high in the air between two poles, is a beautiful piece of public art, and a permanent addition to Folkestone’s seafront since the 2011 Triennial. It rings out over an abandoned space, left when a seafront amusement park closed. The booklet explaining the work in the shipping container, Centipede, wasn’t available to take away. 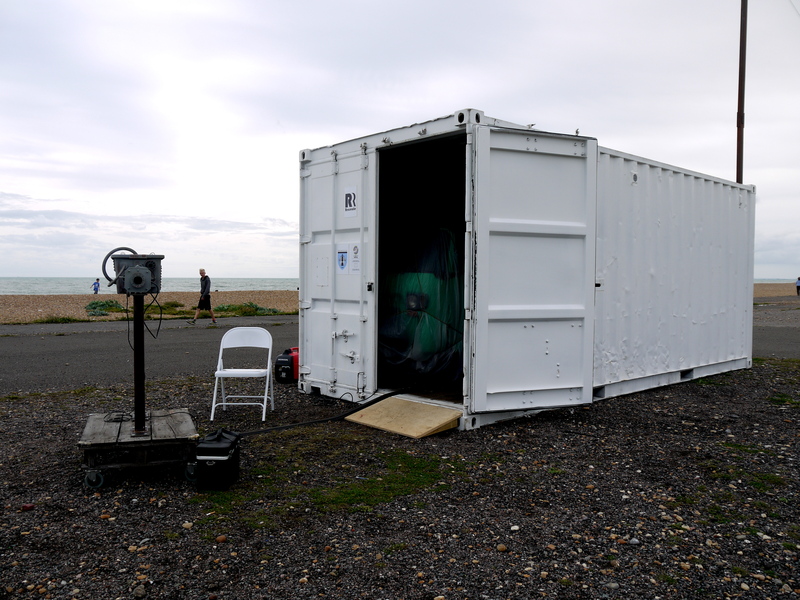 Which fits – the container was a secret research laboratory, funded by the EU, with a range of equipment monitoring the local area for signs of the mysterious centipede. Secret equipment, mounted on a tuk tuk, was wrapped in tarpaulin. Everything’s waiting to be uncovered here and I like the mystery. From the seafront we wandered back into town, through the Creative Quarter. These steep, narrow streets are giving Folkestone a new heart, full of quirky and interesting shops. Somewhere in here (but we overlooked it – ironic in a festival called Lookout, no?) is Andy Goldsworthy’s shop. We did watch Strange Cargo scanning people, though. We headed for Wilkinson’s, instead – in search of both flip-flops and Hollington & Kyprianou‘s The Castle, art inspired by the idea that as every Englishman’s home is his castle, so he should carry out DIY improvements. Some great interventions in the shop are confusing shoppers. In search of fresh air, we headed back towards the seafront, walking along the clifftop and stopping to watch the headless chicken of Whithervanes before catching the lift down to the beach again. We headed back towards the harbour, where most Fringe and Triennial activity seems to be happening. 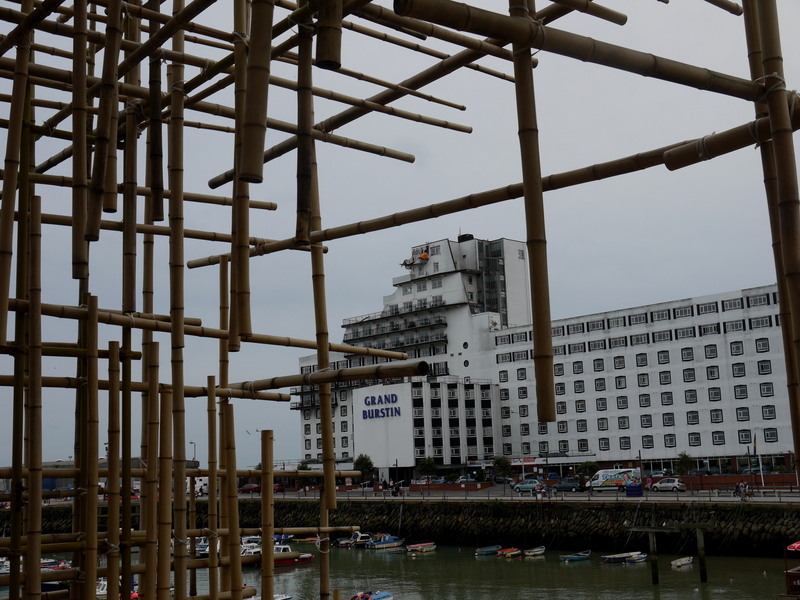 Gabriel Lester’s bamboo pagoda over the unused railway line was closed, officially, but is actually uncloseable so was soon reopened by people-power. Straddling the line and with a view down to the station and ‘Is Why The Place’, it’s a calm space in a place that should be inaccessible and busy. The pagoda looks out towards the Grand Bustin, a monolithic hotel with architecture like something from Soviet Russia. Perched just above the highest balcony is Alex Hartley’s Vigil. Hartley has installed a climber’s camp, hanging outside the top floor rooms. This spot, the artist says, is ‘a unique vantage point from which to look out over the sea and back over the town [from which] a lone occupant will inhabit these exposed ledges, acting as a lookout over the sea, harbour and extended coastline.’ That’s a beautiful, poetic explanation, so I was looking forward to seeing Vigil – and I enjoyed the feeling, walking around the town, that there was somebody up there, watching over us. However, it’s not unique vantage point nor a lonely spot, as hotel visitors have much the same view from their balconies, and I’m not sure the work stands up to this contradiction. Round the corner from the pagoda is a piece which really isn’t quiet. Michael Sailstorfer has rather won the Triennial with Folkestone Dig. 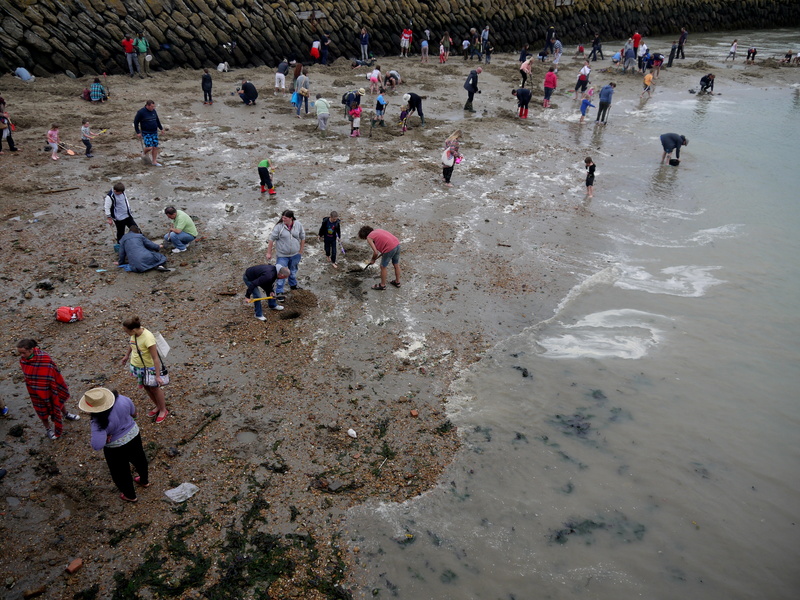 £10,000 worth of small gold bars have been buried on a small beach by the harbour. Dig, find them, they’re yours. This simple idea has created an incredibly powerful work, bringing hundreds of people together every day in a communal activity with a selfish end. It’s a spectacle, worth watching from the harbour wall – but it has also created an incredibly social space, where strangers happily talk to each other while doing a job of work which they know has little chance of success. And that’s totally in the spirit of Folkestone and the seaside town; a place where holidays were an industry, where work is about leisure. So, with the Triennial and Fringe, it seems that Folkestone is finding a way of reinventing itself, presenting challenging art in public places. It’s certainly worth your time to visit, and you’ll find meaning, challenge and enjoyment when you do. But Folkestone’s still very rough around the edges (it felt much, much harsher than Margate, say) and while that adds an edge, it also left me a little uneasy. A couple of times, I saw locals reacting angrily to the art – similar to the problem faced by Turner Contemporary in Margate. I really believe that good art (considered, careful, made for the site and calmly explained) can make the places we live, better. And I hope that with events like the Folkestone Fringe and the Folkestone Triennial, we can persuade other people of the power of art in public spaces, too. That, yet again, England’s seaside towns are the research and development spaces for society. Spectacle, yes; challenge, for sure; but enjoyment, shared experience, education, and enlightenment too. Reading Dan Thompson’s post today, having mentioned the Triennial in last nights blog, I thought it was well worth a reblog. 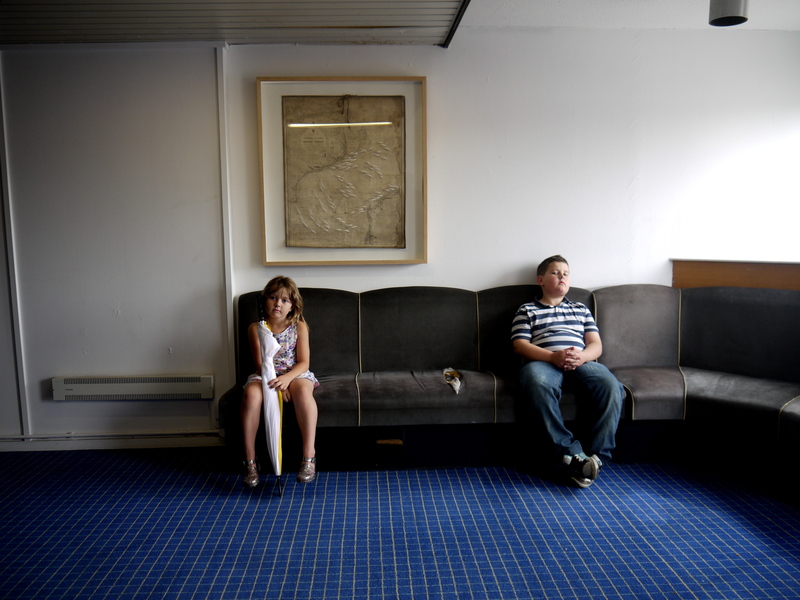 Love the photo of Thurle Wrights work in Seaafar (the apparently unsigned unlabelled exhibition in the old ferry waiting room). Sadly it was only on last weekend, but more of Thurle Wright’s work is in Marrin’s bookshop, in a totally different and unique setting. I was also interested in the comments comparing Folkestone to Margate. Prior to making the move we visited Margate and had the opposite reaction finding Folkestone less harsh but with enough edge for us not to miss East London too much. Dan, hope you come again!